One of the biggest challenges with maintaining optimal air quality during cold weather is the fact that much of what we are trying to control is constantly being generated. For instance, if we had an empty house and filled it with smoke we could turn on a few exhaust fans and within minutes the smoke would be gone - problem solved. But, when it comes to gasses such as ammonia and carbon dioxide which are constantly being generated, it is a neverending process to keep them under control. For example, during the minimum ventilation, “off cycle” ammonia levels will slowly rise as the ammonia produced by the litter builds. When the minimum ventilation fans turn on the ammonia levels will quickly decrease as fresh air is added to the house. But as soon as the exhaust fans turn off, the ammonia level will start to rise again and by the end of the “off cycle” it will be back to where it was prior to the fans turning on. 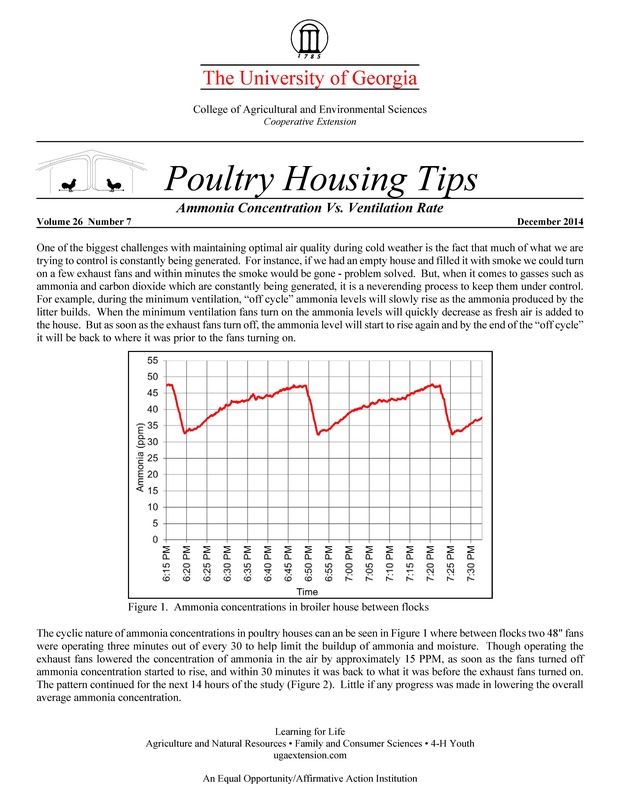 The cyclic nature of ammonia concentrations in poultry houses can an be seen in Figure 1 where between flocks two 48" fans were operating three minutes out of every 30 to help limit the buildup of ammonia and moisture. Though operating the exhaust fans lowered the concentration of ammonia in the air by approximately 15 PPM, as soon as the fans turned off ammonia concentration started to rise, and within 30 minutes it was back to what it was before the exhaust fans turned on. The pattern continued for the next 14 hours of the study (Figure 2). Little if any progress was made in lowering the overall average ammonia concentration. The same cyclic pattern of ammonia concentrations can be seen in Figure 3 where minimum ventilation fans were operating 90 seconds out of five minutes in a house with three-week-old birds. Minimum fan operation decreased ammonia levels by approximately 7 PPM, but by the end of the minimum ventilation fan “off cycle” they rose the same 7 PPM. The average ammonia concentration remained essentially the same, 33 PPM, over the course of the night. For any minimum ventilation fan setting the ammonia levels will tend to reach a level of equilibrium. In Figures 1, 2, and 3, though the minimum ventilation fans reduced ammonia concentrations quickly, the reduction was temporary and over the short term average ammonia levels did not significantly change. The equilibrium ammonia concentration can of course be lowered by increasing the minimum ventilation rate. An important fact to keep in mind is that the reduction in the equilibrium or “average” ammonia concentration will be roughly proportional to the change in exhaust fan runtime. This means that in order to make large changes in average ammonia concentrations, relatively large changes in minimum ventilation fan runtime need to be made. For instance, the minimum ventilation fan runtime in the house illustrated in Figure 3 was increased from 90 seconds to 120 seconds out of five minutes (4:00 am). The increase in fan runtime of 25% reduced average ammonia concentration by 22% (from 33 to 27 PPM) (Figure 4). Increasing fan runtime from 90 to 150 seconds, a 40% increase, reduced ammonia concentration by 35% (from 33 PPM to 22 PPM) (Figure 5). So in short, if you want to cut your ammonia levels in half, double your minimum ventilation rate. This holds true if the ammonia concentration is 80 PPM and you want to drop it to 40 PPM or even if the ammonia concentration is 40 PPM and you want to decrease it to 20 PPM. Does this mean that if you have high ammonia concentrations that you may have to double or quadruple your minimum ventilation rates indefinitely? Not necessarily. Though high minimum ventilation rates will help to keep ammonia levels to a minimum they will also tend to address the root cause of ammonia: litter moisture. Over time, higher ventilation rates will tend to reduce litter moisture levels, which in turn will reduce the ammonia generation rate, which in turn leads to lower ammonia levels and an overall reduction in the minimum ventilation rate required to keep ammonia concentrations to a reasonable level.